Book yourself a revolutionary shopping experience! We can bring the award-winning ‘Lady B’ directly to your doorstep, allowing you to host your own event without disturbing your home, office or community premises! We work our magic, bringing lots of gorgeous, affordable clothes, handbags and accessories – and styling tips if they’re needed. Hi, I am Lesley – designer, owner, stockist and driver of the lovely Lady b, the revolutionary boutique in a bus. Lady b is free** to book! We travel to venues and events across Dorset and the south, including pubs, hotels, private homes, community centres, fetes, fayres and rural village locations. 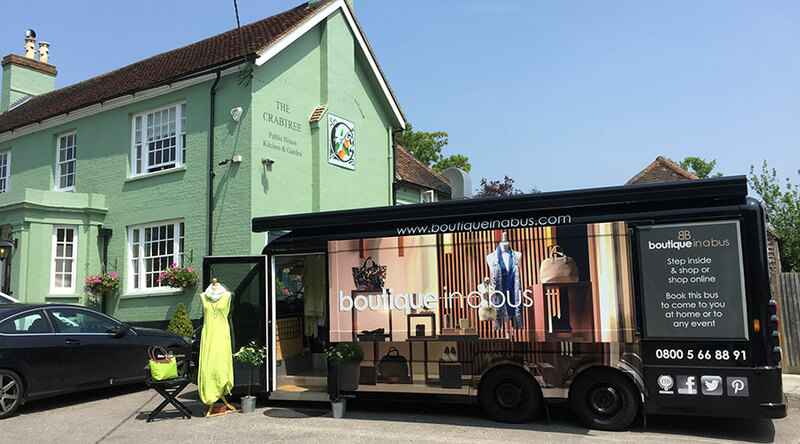 We will drive to your pub, office, home, event or other venue (anywhere with parking suitable for a 9m x 5m vehicle) so you can shop in a well-designed, air-conditioned and surprisingly spacious mobile boutique stocked with a great range of elegant, timeless and affordable clothing & accessories. Late cancellation of a booking (made within 14 days of the date of the event) whether it be advised in writing or verbally, may result in a cancellation fee. Any such fee to be at the discretion of Boutique in a Bus Limited. Simply complete as much of the booking enquiry form as you can and await our prompt response. We look forward to hearing from you! How many people will be there (approx)? Lesley & her beautiful bus are just FAB! Fantastic concept & gorgeous clothes. Boutique in a Bus is the only place I have found the clothes I love at a price I can afford. Lesley is amazing at styling and showing me what makes me look brilliant. And the bus - you have to see it to really appreciate it. Absolutely fantastic. The choice is unbelievable. Lesley is a great fun lady with a zest and passion for helping you look your best. Innovative and great quality, affordable clothing. Thank you "Lady B" for a lovely day here in Southampton. My friends and family had a wonderful time and you were an amazing stylist Lesley - I am thrilled with my new look! I would just like to encourage anyone reading this post who are curious about this wonderful experience to go ahead and book! Fabulous. Absolutely wonderful! Beautiful clothes and accessories! 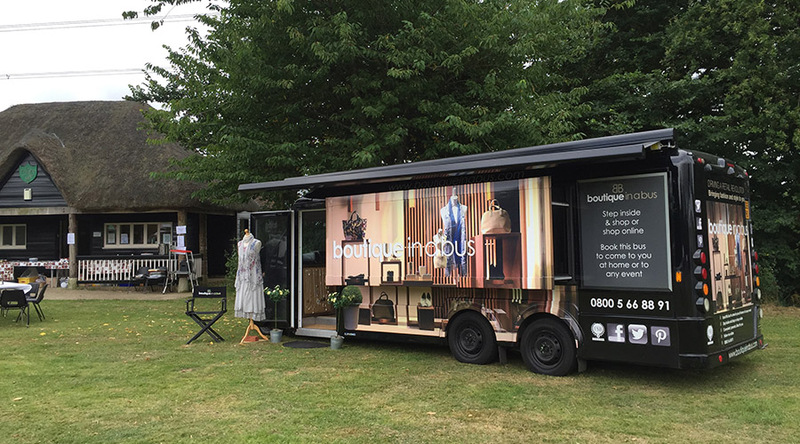 I LOVE, LOVE LOVE boutique in a bus, 'Lady B' has to be seen to be believed! Lesley has the most amazing style. She is able to buy for all of us. Just that little something different that is so easy to wear. She will tweak it here, fold it there, add one of her many scarfs or belts if desired, and off you go! Add all of that to incredible prices and you are dancing down the steps with a bag full of goodies ... you can't help yourself!! 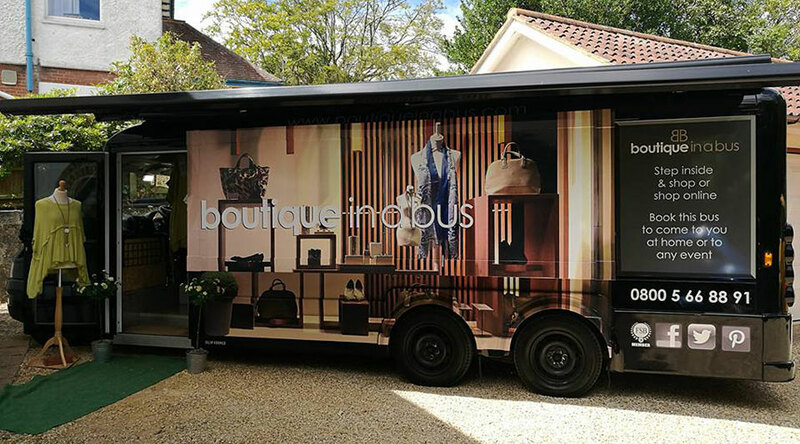 I LOVE, LOVE LOVE boutique in a bus, 'Lady B' has to be seen to be believed! Lesley has the most amazing style. She is able to buy for all of us. Just that little something different that is so easy to wear. She will tweak it here, fold it there, add one of her many scarfs or belts if desired, and off you go! Add all of that to incredible prices and you are dancing down the steps with a bag full of goodies ... you can't help yourself!! The clothing is beautiful, with styles for all women. The bus is awesome and a real fun experience, plus it's affordable and unique! What a brilliant idea and so beautifully executed! The clothes and bags are fabulous and all so reasonably priced.